A few of the other Madame Alexander dolls using the Wendy face are Alice in Wonderland, Carmen, Portraits, Fairy Queen, Southern Girl, Madalaine DeBain, Sleeping Beauty, W.A.A.C., Cinderella, Princess Flavia, Juliet and the all-time favorite of the celebrity dolls, Scarlett O'Hara. Released in 1937 during the height of the popularity of Margaret Mitchell's book, "Gone With the Wind," Scarlett had several costume changes during the following years, some coinciding with the premiere of the movie. And of course, there is the smiling face of Sonja Henie. (Circa 1939). 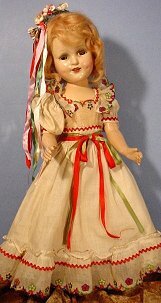 Modeled after the vivacious Norwegian figure skating champion, with her familiar wide smile is captured in the Madame Alexander doll. Sonja Henie won three Olympic titles before her debut on the movie screen. 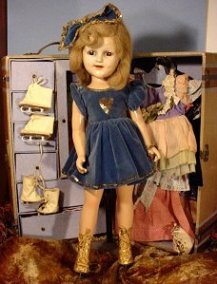 The Sonja Henie doll was made several years with various changes of costume. She ranged in size from 14" to 21". My favorite child star of the era is another of Madame Alexanders more impressive achievements. Margaret O'Brien (Circa 1946-1947). Who can forget the doom stricken little girl in "Meet Me in St. Louis", who was always burying a doll who had died of some terrible invented disease. 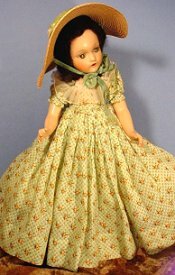 Using the Margaret mold, yet another recognizable Madame Alexander celebrity doll character was created. 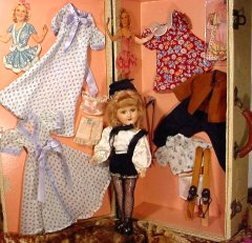 eBay has a rather large set of listings of vintage Madame Alexander dolls for sale, if you are interested in a purchase, or to find values if looking for costs, it is necessary to register with eBay. Jane Withers--of course--Among the Madame Alexander Dolls of note. Jane Withers was another celebrity child who is forever encompassed in composition by Madame Alexander. The young star was a familiar face to movie buffs in the mid to late 1930s, thus the introduction of the doll (Circa 1937). There are many more composition celebrity dolls created by Madame Alexander. Check back in the future to see additional pages covering the babies and other composition lovelies. Even a project involving Scarlett O'Hara that I have been working on only in my head for the past 5 years. Perhaps the knowledge that someone is dropping in occasionally to check on my progress will create the need for me to actually attack the project! 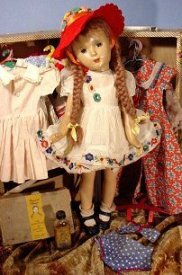 Madame Alexander Dolls on Review...by Marjorie V.
The above books are out of print , but, are often offered on ebay...ebay/dolls & bears/ clothing & furniture/antique/vintage.